Egypt's army latest campaign in North Sinai is the biggest recent operation against terrorist organisations and has been launched based on fresh leads, according to military and other sources. The Martyr's Right is a largest and most comprehensive operation aimed at rooting out and killing 'terrorists' since July's immediate response to militant attacks. In early July militants affiliated to the terrorist group Islamic State (IS) mounted their largest attack in months on Egypt's security forces. The attacks concentrated on the cities of Sheikh Zuweid and Rafah and resulted in over a hundred deaths, most of them militants killed in the military's response. Operation The Martyr's Right targets sites in Rafah, Arish and Sheikh Zuweid, all towns in northern areas of the peninsula, said the military statement. The military has already stopped and arrested many of the North Sinai-based militant leaders and organisers of terrorist operations. Major general Mohamed Ali Belal explained that all major military operations against militants are given names to distinguish them from routine operations to destroy Egypt-Gaza smuggling tunnels or other standard actions. "A comprehensive campaign has been launched based on an estimation of the situation and fresh information about many hideouts and targets. Such campaigns are undertaken with a clear plan… and with a timeframe," he explained. Eyewitnesses in North Sinai confirmed there had been a build up to Operation The Martyr's Right in terms of troop deployment. Sheikh Abdullah Gahama, deputy head of the Coalition of Arab Tribes, told Ahram Online that sites targeted by the operation are completely sealed on the ground. "Tribes largely support this operation," Gahama said. But. He said, "tribes are not playing a direct role in the operation." "The security situation has notably improved in North Sinai with the army largely having things under control over the past three months," he added. The army said it has beefed up security around major government institutions and private buildings in the region as well as roads. In Be'r Abd, a city some 80 kilometers from North Sinai's capital Arish, a resident said there are an unprecedented number of military checkpoints on roads at the moment. Mohamed Hamad, son of a tribal leader in Be'r Abd, added that vehicles are thoroughly checked by security personnel. "There are four new checkpoints beyond the city gate," he stated. "The [security] situation has been met with real satisfaction from the residents of the city and the surrounding areas." The Egyptian army announced on television that the extensive operation started at the crack of dawn on Monday. Aimed at rooting out Islamist insurgents, the operation had resulted in the killing of 29 terrorists by the time of the statement. The army added that a soldier and a conscript were killed during the offensive and four others were wounded when a bomb struck their armoured vehicle. 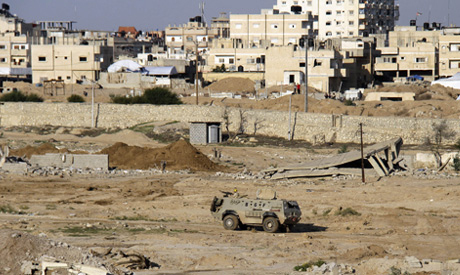 North Sinai, which borders Israel and the Palestinian Gaza Strip, is a stronghold of Islamist militant group Ansar Beit Al-Maqdis, which has renamed itself Sinai Province after proclaiming allegiance to the IS in 2014. Sinai Province has intensified its attacks against army and police personnel since the ouster of Islamist president Mohamed Morsi in July 2013. Morsi has since been convicted of a number of violent crimes. Egypt began intense security action in the region in August 2012 after an attack near the border with Israel and Gaza killed 16 Egyptian soldiers, at the time the deadliest domestic attack on Egyptian troops for years. Troops have since then been fighting an Islamist insurgency that has left hundreds of army and police personnel in Sinai and across the country dead. Good job clean the entire region, the sooner the better. Keep the terrorists on the run till they are decimated. There is no glory in terrorism against innocent people despite the vile IS propaganda claims. They sure don't show their own dead, it would hurt their recruiting efforts.